Reach 1000 listeners with a 30 sec audible advertisement on Argentine Tango Radio: ~ 3 EUR. Reach 1000 users with a text advertisement inserted to users' news feed on Facebook: ~ 11 EUR. Ad is played every 2 hours during daytime (CET 9:00-20:59). Ad is played every day for a calendar month. Ad is played every 2 hours during nighttime (CET 21:00-8:59). Ad is played every 2 hours during all day. Please contact us at to inquire about availability. There are at most 3 ad slots available every hour, thus the radio can at most carry 12 different advertisement packages in a month. Step 1. Write the text of your advertisement. Please try to keep the text short and simple, no more than 350 characters. "Embrace the flow at the Noches de Hungría, the tango marathon of Budapest. www dot Noches dot hu. Because no more words are needed." Short, but powerful. It is 131 characters long, hence it allows for a longer musical wrapper. Listeners can find all information online at the announced website. 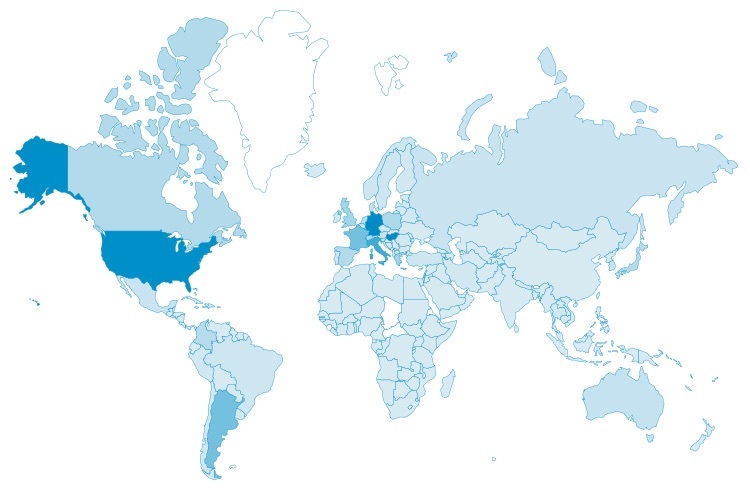 "Participants from over 50 countries. The nicest Hungarian dancers. Centrally located, amazing venues. A winning DJ team. And great maestros like Pablo, Corina, Marko, and Maja. El Sabor de Hungría Tango Festival: the perfect excuse to enjoy the last warm embrace of the summer with your tango friends in the majestic atmosphere of Budapest." Long, but informative. It is 341 characters long, hence the musical wrapper needs to be short, but listeners get a full picture of the event, including the names of the participating maestros. Step 2. Choose which associate of Argentine Tango Radio you wish to announce your text. Optional: choose a classical tango which you would prefer to use for the musical wrapper around your text - or leave the choice to us if that's what you prefer. Important notice: the audible advertisement we create for you is for distribution on Argentine Tango Radio only. Argentine Tango Radio retains all rights to the audible files we create and you do not have permission to use them in any other medium, including but not restricted to other radios, websites, blogs, social networking sites, audio/video sharing sites etc. By submitting a request to create your audible advertisement you agree to these terms. As tempting it may be, please don't ask for exceptions. We work with professional announcers and without such restrictions we would not be able to offer you such a low price for the audio file creation. Thank you for your understanding. Step 3. Send us these details, and transfer your due cost with Paypal / credit card payment for the audible advertisement creation and for the chosen advertisement package. Step 1. Create and send us your sound file. It is best if you create your own sound file, since then you can fine tune yourself what your audience is going to hear. Remember, it can not be longer than 30 seconds. It is easier to create a sound file than it sounds. I created a short video to show one way of doing so using WavePad, a sound editor program that is freely available for Windows and Mac. In case you don't want to worry about this, you may also send us an at most 20 seconds long voice recording (you can even do this with your phone's sound recorder) and a title of a classical tango, and we can create your ad from these two files for you. Step 2. Transfer your due cost with Paypal / credit card payment for the chosen advertisement package. During December 2018 Argentine Tango Radio radio had 524,111 listeners (access count) with a total of 91,740 listening hours (the audience is large and varied). Regionally approximately 60 percent of the listening hours comes from Europe, 20 percent from North America, and the rest 20 percent from other regions; roughly 2/3 of the listening hours happen during "daytime" (between CET 9h-21h) and 1/3 of the listening hours happen during "nighttime" (between CET 21h-9h). These numbers translate to approximately 30,700 impressions for the "Daytime" package, 15,300 impressions for the "Nighttime" package, and 46,000 impressions for the "All day" package. Estimated CPM (advertising cost per thousand impression, on the basis of the 3 month package) for our 30 second long advertisement is less than 3 EUR; for comparison, Facebook's average CPM for an ad inserted to the news feed is around 11 EUR (data: Q4 of 2017). We do not currently plan to do text-based and/or other forms of visual advertisements and we do not plan to enter into cross-linking agreements etc. for our website(s). If you like the radio, please link to it from your own site (or add your own tango radio player button), it is made with love for the benefit of the tango community. We do honor patrons of Argentine Tango Radio with certain options, including displaying up to at most four icons on the main website of Argentine Tango Radio and in the Android application of the tango radio. To see the patronage options in detail please visit our Patreon page and become a patron! Contact us at to inquire about further details.